For most parts of state government, employment looks like looks a lot like it did four years ago. Job levels have remained flat in recent years, despite steady growth in the private sector. So far at least, 2016 is shaping up to be another year of little to no growth for state employment levels. 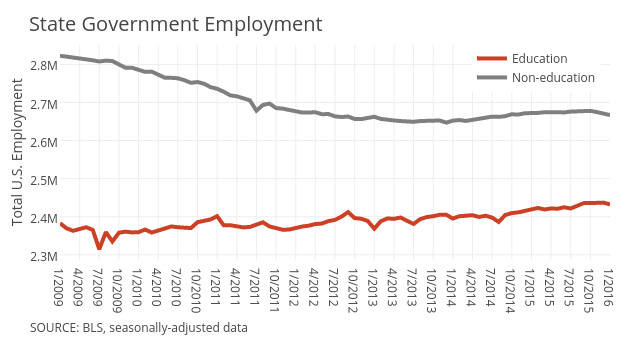 Updated data released Friday by the Labor Department indicates total state government employment dipped slightly each of the past three months. The latest budget proposals from governors further suggest that most states are looking either to trim payrolls or keep employment levels from growing. Agency heads in states such as Louisiana are bracing for further cuts. Newly elected Gov. John Bel Edwards was expected on Friday to outline his agenda for a special legislative session aimed at closing the state’s $700 million budget shortfall for the current fiscal year. Hiring freezes, furloughs or reduced workweeks are possibilities. When reductions to the state's general fund are necessary, Decoteau said it's generally larger executive branch agencies, such as social services and corrections, that face the biggest challenges. The state Department of Health & Hospitals, though, is expected to hire more than 200 workers as a result of the Medicaid expansion Edwards ordered last month. In California, Gov. Jerry Brown’s budget proposal calls for keeping the workforce at roughly the same level as last year. Still, it would still represent a decline of more than 10,000 positions from the fiscal 2015 budget. Oil revenue shortfalls may force workforce reductions in some states. With Alaska facing a $3.5 billion shortfal, Alaska Gov. Bill Walker announced a hiring freeze and travel restrictions last month for most agencies. Nationwide, public employment in higher education has climbed in recent years, but at a slow rate. Average monthly employment at public colleges and universities grew by about 25,000 positions last year, according to Labor Department data. Meanwhile, totals for all other areas of state employment have moved little after suffering steep declines in the aftermath of the recession. In the latest fiscal survey from the National Association of State Budget Officers, four states reported utilizing layoffs to manage their fiscal 2016 budgets: Alaska, Connecticut, Louisiana and Vermont. Three other states -- Louisiana, Massachusetts and Vermont -- also implemented early retirement programs. Along with budget cuts, the aging of the workforce could lead to more retirements in states. In 1994, just 13 percent of state and local government employees were age 55 or older. By 2014, the share had climbed to a quarter of the workforce, according to a Government Finance Review article. Retirements are projected to occur gradually over time, however, rather than coming all at once. NOTE: A comment regarding Louisiana budget reductions and state agencies in this story has been updated.